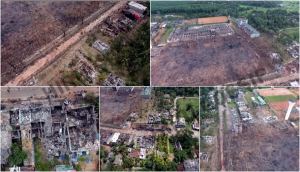 The people who have been severely affected due to the explosion of the arnoury at Salawa Army camp have begun an agitation in Colombo to protest against neglecting paying compensation for their losses. Despite their meeting the Divisional Secretary and relevant authorities, there hasn’t been any positive response from authorities and the victims carried out several agitations near the army camp. As they did not get any favourable response they have decided to agitate in Colombo today (17th) to make the authorities listen to their woes.